In response to investigation of volunteers who killed Jaffa murderer, Rabbi Ariel says use non-lethal force if terrorist has been caught. 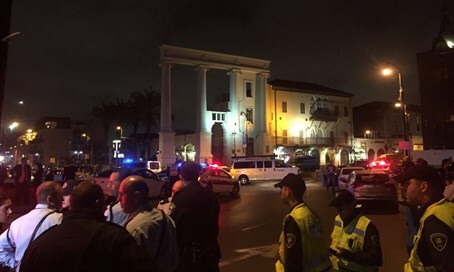 In the wake of the police investigation of a police volunteer who shot the Arab terrorist behind Tuesday night's lethal stabbing spree in Jaffa (Yafo), Arutz Sheva on Thursday spoke with Rabbi Ya'akov Ariel who opined that one must not kill a terrorist who has been neutralized. The terrorist stabbed 11 people in Jaffa, murdering US tourist Taylor Force, before being shot and killed by two civilians who volunteer with the police. Video of the incident raised the fury of radical leftist Yariv Oppenheimer, head of Peace Now, who condemned the "extra-judicial execution" of the murderer. Rabbi Ariel, the rabbi of Ramat Gan near Tel Aviv, told Arutz Sheva that in "lone-wolf" terror attacks the attacker should not be killed if he is already neutralized - recent statements by Chief Sephardic Rabbi Yitzhak Yosef, Rabbi Meir Mazuz, and Tzfat (Safed) Chief Rabbi Shmuel Eliyahu have addressed different aspects of the issue as well. "We have to make a clear distinction here between war and civilian actions," said Rabbi Ariel. "In civilian actions, if someone comes to kill you need to prevent the killing, (as per the Torah precept) 'don't stand idly by your neighbor's blood,' but if it's possible, do that by harming one of his (the terrorist's) organs." "While sometimes a person is unable to consider things in an organized manner during a time of action - they must act spontaneously within seconds - if there is a possibility to consider and time allows, you must first wound but not kill," opined the rabbi. "It is also forbidden to just kill a non-Jew if it is possible to avoid the killing and it is possible to wound - all of this is under civilian conditions." Regarding the question of whether to wound or kill an attacking terrorist, there have been recent cases caught on film of terrorists continuing to attack even after being shot. In contrast to his opposition of civilians killing terrorists unless it is necessary to stop them, Rabbi Ariel said in war conditions all such limitations go out the window. "In a situation of war you fight and kill the enemy, and even there we aren't talking about mass murder God forbid, but you do fire shells or drop bombs and you can't consider inflicting harm to (just) one part of the body without killing, in war you fight the enemy among other things so as to kill him." Despite the massive scale of the current terror wave which began last September, Rabbi Ariel gave the opinion that currently Israel is dealing with "lone-wolf" terrorists conducting one-on-one attacks, and therefore if possible, one must try to wound the terrorist but not kill them. "If it's possible not to kill and it's enough to wound them you don't need to kill. What's more, killing the terrorist in the end doesn't bring any benefit but rather (brings) damage because according to Islam there is blood vengeance, if you wound him then there isn't blood vengeance but if you kill then in effect you haveopened a never-ending cycle," he claimed. Calling not to "inflame" Muslim terrorists, he added, "according to Islam those who are killed are martyrs, so if you just inflame them, it's better to act judiciously." "If there were those who killed the wounded terrorist they need to be investigated and judged, particularly if they did it while worked up emotionally," concluded the Ramat Gan rabbi.